The central portion of the picture is a positive image whereas an exaggerated inverted view is shown in the outer regions so faint surrounding structures are more readily discerned. This image was produced with a RCOS half meter telescope, an Apogee Alta U16M camera and Astrodon E-Series filters. Exposure lengths were 570 minutes Luminance, 240 minutes Red, 240 minutes Green and 240 minutes Blue (All 1X1). Located in the constellation of Leo, extensive debris shells from the accretion of one or more long gone satellite galaxies encompass spiral galaxy NGC 3521 like a vast, cosmic bubble. This image was produced with a RCOS half meter telescope, an Apogee Alta U16M camera and Astrodon E-Series filters. Exposure lengths were 570 minutes Luminance, 240 minutes Red, 240 minutes Green and 240 minutes Blue (All 1X1). Mouse over to view inverted image. 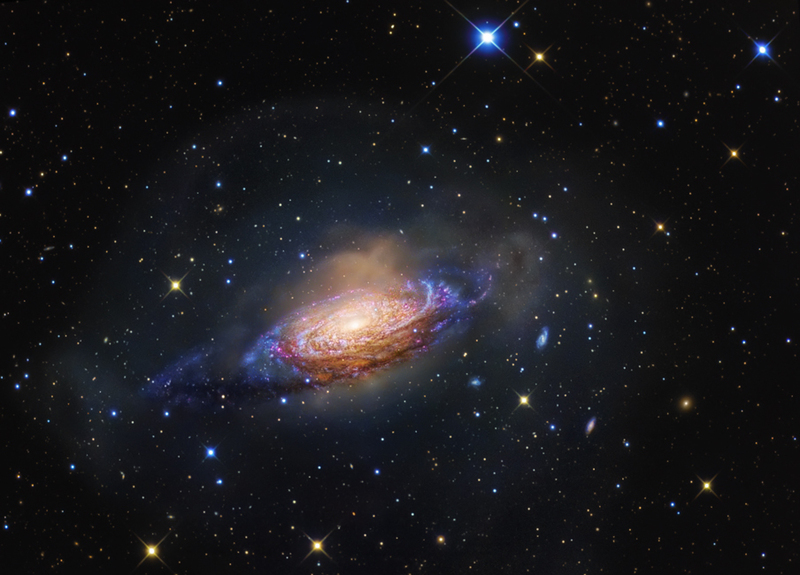 The Bubble Galaxy (NGC35211) is another in a series of ultra-deep full color images based on the results of a productive collaboration between private and professional astronomers, led by Dr. David Martinez-Delgado (Max Planck Institute for Astronomy). This project was dedicated to exploiting the scientific potential of modest aperture telescopes. The standard cosmological model predicts galaxies formed and evolved hierarchically though a process of mergers following the Big Bang. Since evidence of this consolidation should be observable in galaxies located near the Milky Way, the team's investigation sought to uncover previously unsuspected stellar streams in eight galaxies outside the Local Group. NGC 3521 is another remarkable example of the team's ultra-deep pilot survey of selected isolated spiral galaxies in the Local Volume. This view of the galaxy updates and improves the original data reported with the pilot survey. This new picture is based on recent exposures that exceed those used for the study by more than two hours. As a result, a large surrounding shell can now be discerned possibly representing minor mergers that precede those the team initially reported. NEW! 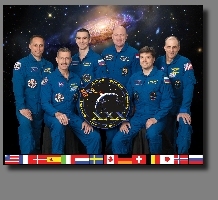 This image was selected as the back drop for the official crew portrait of Expedition 30 to the International Space Station.